Aristotle articulated three basic ‘levers’ of persuasion in public oration: Logos, Pathos and Ethos. Logos (‘reason or order’) is the use of reason/logic and facts to advance an argument. Pathos (‘emotion or feeling’) seeks to arouse emotions to win arguments. Ethos (‘character’) is the use of personal character or group connections/solidarity to win arguments. Skillful, though immoral, orators can often win arguments through the use of lies and deceptions. Logos is manipulated by presenting faulty arguments (false premises, illogical conclusions, strawman, etc.) or by the use of false information (misleading statistics, partial truths, lies). Pathos is manipulated by inciting irrational emotions (fear and anger by stoking up class or gender warfare, etc.). Ethos can be manipulated through false associations (‘I am one of you’) or by assailing an opponent’s character (ad hominem attacks, character assassination). Modern Man is confused and discouraged by the nature of public debate. Key influencers (politicians, academics, special interest groups) push agendas to achieve a secular utopia, using scientific persuasion techniques (e.g. focus groups, mass media) to distort and distract. Deceit is prevalent in a ‘post-modern society’ that debates if ‘truth’ exists leading many to fall deeper and deeper into Sin. Jesus Christ, the Divine Orator, comes to decisively argue His case in the Eternal Argument that contrasts the way of Satan and the way of God. Much is at stake in the Eternal Argument, not only human happiness on earth, but the eternal salvation of souls. Is Divine Ethos – There can be no higher Ethos, or character, than Truth itself. The Gospels proclaim that Jesus Christ is the Truth (John 14:6; CCC 217) and that He was born to “bear witness to the truth” (John 18:37). In Jesus Christ, man can fully “know the truth…[that makes them] free” (John 8:32). Only Jesus promises to send “the Spirit of truth” to guide men to all truth (John 16:13). Irrefutably demonstrates His Divine Ethos – Jesus defeats the lies of Satan in the wilderness (Matt 4:1-11), by repeatedly casting out demons (cf. Matt 8:28-34) and by using the Satan-inspired evil of Judas (Luke 22:3) for the Glory of the Cross and Resurrection (CCC 2853). He performs miracles (healing, power over nature and death), offers divinely inspired teaching (parables, sermons, use of scripture), shows omniscience (able to read minds, prophesize) and rises from the dead with a miraculous glorious eternal body. He leaves the full Truth in His Church and the Gospels. Intimately knows His audience – Has complete insight into the hearts and minds of people (John 2:23-25). From growing up in rural Galilee, Jesus has an intimate knowledge of daily life including Jewish cultural values (e.g. Love, hope, faith, truth, righteousness, trust, forgiveness, friendly, communal) and how people live (e.g. planting, shepherding, fishing, carpentry, landlords, kings, etc. ), giving Him the insight into how to appeal to the emotional lives of people with integrity. Uses emotion with integrity – Jesus is often cryptic, leaving His audience yearning to understand (John 5:17). Jesus uses zeal to signal the importance of clearing the temple (John 2:17). He extensively uses healing to touch the hearts and minds of His followers (the raising Lazarus). Is Divine Wisdom – Jesus Christ is the “Word” who is with God since the beginning (John 1:1-2) and is Wisdom personified (Isa 55:10-11). The Greek for “Word”, is logos, which also means “logic or reason”. Jesus is the Wisdom that God has given Man (1 Cor 1:30) and so, is the ultimate definition of Truth. In the Eternal Argument, only Divine Wisdom makes an irrefutable argument. Uses powerful reasoning techniques to make His case – Jesus uses Greek logical tools (e.g. a fortiori, reductio ad absurdum) and traditional Jewish rabbinical methods (e.g. Peshat, Remez, Drash, Sod). Jesus uses deductive and inductive logic. He uses fact-based arguments (John 5:31-46). He uses questions and dialogue (Matt 16:13). His teaching includes theological (e.g. Bread of Life) and practical applications (e.g. teaching on adultery/lust and anger). Has complete knowledge of scripture and uses it – Rabbis and scribes were experts in Jewish scripture. Jesus Christ, the “Word”, and author of scripture, uses scripture extensively: quotes 24 of 39 books of the OT with precision; saying “it is written” almost 60 times. Delivers world-changing oration – Jesus uses oration approaches that are vivid, memorable and repeatable. He offers “sound bites”/aphorisms (e.g. casting pearls before swine, seek and ye shall find, etc.). Uses commonplace imagery in provocative ways: mustard seed (Matt 13:31); yeast (Luke 13:20-21), treasure hidden in a field (Matt 13:44), etc. Incorporates parables that offer various levels of spiritual richness that are enduring and endearing and have memorable characters: The Good Samaritan, The Prodigal Son, The Vine and Branches. 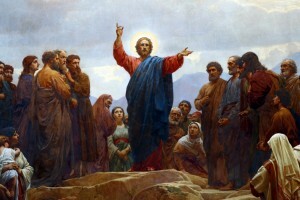 The Sermon on the Mount (Matt 5-7) has been called the most commented upon speech in human history. Exposes and demolishes false doctrines in public debate using scripture and logic – Jesus carefully picks his battles with his opponents, sometimes choosing not to engage (Matt 12:15, Luke 4:30, John 6:15). Though only a carpenter’s son (Matt 13:53-56) with no rabbinical pedigree, Jesus goes up against the Pharisees, Sadducees, scribes and priests many times in the Gospels, decisively correcting them (CCC 581) with winning logical arguments across a wide variety of doctrines (cf. Mark 10:2, 12:28; Luke 11:15, 14:1, 20:20, 20:32; John 8:2-11). Jesus’ superior teachings are so decisive, that after the Jewish teaching elites tangle with Jesus, they no longer “dared to ask Him any question” (Mark 12:34). Combines symbolic acts with oration to persuade – Breaks false cultural/religious rules– Jesus picks grain on the Sabbath (Matt 12:2), heals on the Sabbath (Luke 14:1-6), eats with sinners (Luke 7:33-34) and touches the impure (Matt 8:3, 9:20, 25). Jesus physically clears the Temple (John 2:2:18), provocatively enters Jerusalem as a king (Mark 11:1-11), and suffers the Passion to proclaim Truth.